who spent more time in training and using the ProReal software. 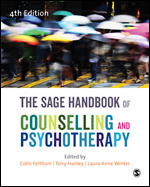 Fourth Edition, edited by Colin Feltham – Emeritus Professor of Counselling & Psychotherapy, Sheffield Hallam University; Terry Hanley – University of Manchester, UK; and Laura Anne Winter – University of Manchester, UK. You can find my contribution in Part 3: Therapeutic Skills and Clinical Practice, Chapter 3.3 Assessment. See Sage Publishing for more details and a preview. The title of the paper is ‘Digital images as therapeutic meaning bridges. Case Study research into the use of avatar-based software by adolescents in school counselling’, van Rijn, B., Falconer C., Chryssafidou. E., Stiles, W.B.